The inclusion of communities in the management of state-owned forest resources has become increasingly common in the last 30 years. Surveys suggest that the forest area under community tenure or management is now approaching 25% of the global forest estate. Community forestry approaches vary a lot, both between countries and sites, and the differences often evolve around institutional dimensions such as benefit- and power-sharing arrangements. Understanding has increased regarding the multiple benefits of community empowerment in the forest sector, as well as regarding the limitations and constraints associated with it. More recently, the emergence of REDD+ has permeated the participatory forestry discourse, and the integration of local communities is seen as a critical ingredient of an equitable REDD+ architecture. This has been supported by some first-evidence from applied research, which cautions against blueprint solutions and advocates for a robust analysis of site-specific, socioeconomic and governance variables and of national enabling environments. We still have, however, a very limited evidence base regarding whether some of the conditions that underpin successful community forestry regimes will also apply to REDD+ schemes. While many elements, such as the role of collective action through user groups, will transfer to carbon forestry, others entail significant differences, such as price volatility or separate carbon rights. What are the cost factors and non-economic barriers to the adoption of REDD+ schemes at the community level? How are synergies and trade-offs between carbon sequestration and livelihood goals identified and managed? What role do different benefit- and power-sharing approaches play, and how are they differentiated in the respective REDD architectures? How can communities effectively and efficiently engage with globalized carbon markets? What responsibilities can communities assume in terms of measurement, reporting and verification (MRV)? Addressing these questions will help to develop guidance for policymakers and project proponents to design and implement REDD+ interventions that involve and benefit communities. This activity includes: a synthesis report detailing good practices and lessons learned in community forestry; case studies in three countries (Nepal, Tanzania and Bolivia) that focus on specific criteria and barriers, such as tenure, social capital and access to credit (included in the synthesis report); and a Guidance Note, intended for an audience of REDD+ policy and operations practitioners, on mainstreaming community forestry in REDD+ strategies and projects. The synthesis report has been printed and was disseminated at two key REDD+ events in Jamaica and Peru. In addition, the report has been made available on the PROFOR website, and a blog post introduces the key findings and messages. 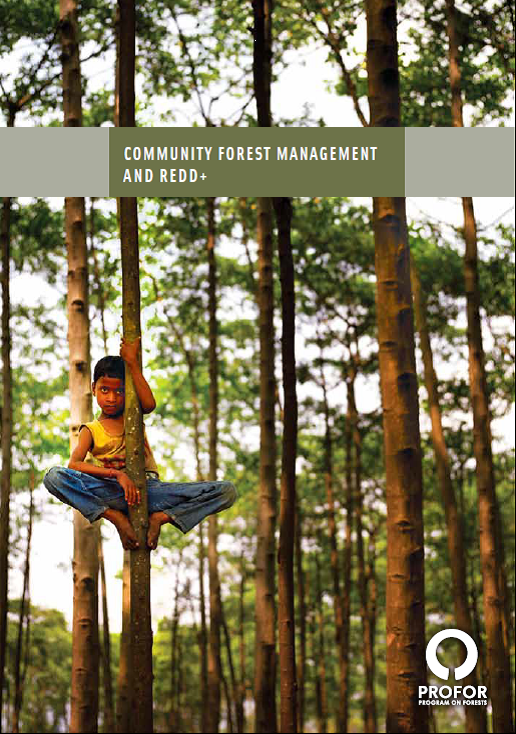 The synthesis report uses a thorough literature review and analysis of primary data collected by the International Forestry Resources and Institutions research network from 57 community forest management (CFM) sites to achieve three objectives. First, a framework for examining interactions and relationships between CFM and REDD+ was established. Second, these relationships were empirically investigated in three countries: Nepal, Tanzania, and Bolivia. All three countries have a strong history of CFM, and each is engaged in the development of REDD+ or related institutional architectures. Finally, based on analysis of the data, key recommendations are provided for communities, project developers, policymakers and researchers. Lessons on the factors that contribute to the success of CFM may be useful in the design of REDD+ programs. In a similar manner, REDD+ may also benefit from harnessing the capital developed by CFM. A partnership between CFM and REDD+ could represent a win-win scenario, with REDD+ providing resources to strengthen CFM sites and institutions, and CFM providing its experience, lessons and capital to achieve REDD+ goals. Three ways were identified in which the two mechanisms may develop synergies, including by: (1) applying the lessons from community participation in forest management to the development of REDD+ strategies everywhere; (2) modifying existing CFM forests and institutions to achieve REDD+ goals (e.g., developing community MRV mechanisms to establish verifiable emissions reductions); and (3) extending the area of forests managed by communities globally. In Nepal and Tanzania, most REDD+ readiness activities and pilot projects are being implemented in CFM landscapes. These on-the-ground actions demonstrate that it is possible to leverage CFM interventions and experiences to support the achievement of REDD+ objectives, and that such an approach can be central to national REDD+ strategies in countries where CFM sites constitute a substantial proportion of the forest estate. These REDD+ pilot projects harness and build on the substantial human, institutional, natural and physical capital in CFM sites. In particular, the institutional capacity of community groups involved in community forestry, and their experience of working with NGOs and government agencies to bridge the local and national levels to achieve sustainable forestry, have been catalytic in the implementation of REDD+ pilot projects. In Bolivia, few formal REDD+ activities took place before the government rejected REDD+ as a market-based mechanism for achieving climate change mitigation. Bolivia has, instead, developed a joint mitigation and adaptation mechanism, which focuses on communities, indigenous peoples and equitable forest resource management. The study finds a strong and statistically significant association between livelihood benefits from CFM and forest dependence among households in Nepal and Bolivia, and between community forest size and forest condition/carbon outcomes in Tanzania. REDD+ brings financial support to improve community forestry activities that have historically been constrained by limited resources. Non-financial benefits include improvements in institutional capacity and human capital. Better monitoring of resource extraction and greater enforcement of rules may result in improved forest carbon and livelihood outcomes. At the same time, REDD+ poses challenges to CFM if it reduces access to forest resources by local communities, or if it creates financial incentives for management recentralization or for benefit capture by elites. In the case study countries, REDD+ has sought to take advantage of the prior experiences and capital developed by CFM. Ultimately, the success of REDD+ as a forest-based climate change mitigation strategy will depend on improved funding, but readiness activities and pilot projects that engage with and learn from CFM are a critical element of long-term, effective, efficient and equitable REDD+.